The 2 Door Modesto Bench has a framed seat that doesn't open. Two paneled doors with diamond knobs open in front. The Modesto's legs curve outward from the paneled sides and show off their hardwood construction with exposed mortise joints. Between the feet are arches on all four sides. Pictured in pine with Harvest stain. Pictured in pine with Black paint. Pictured in rough sawn maple with Earthtone finish. Pictured in pine with Buttermilk paint. Pictured in rough sawn maple with River Rock finish. Pictured in quartersawn white oak with Asbury stain. The Baltimore Hall Seat fills a large piece of empty wall with beautiful hardwood and adds vertical storage space. It's the perfect organizer for a foyer lacking a closet. Because of its many shelves, it can also function as a hallway bench and linen closet. What is so special about such a functional piece is that this hall seat boasts heirloom quality construction. While minimal and solid, it bears style marks such as paneled bench sides and fluting beneath the top. This piece is Amish-made because a home that is lived in deserves wood furniture too. The Bay Hill bench is unmatched in design and comfort. It has timeless design is easy-going and ideal for a home that just wants to have fun. World-class construction is a guarantee with this bench. There are a variety of stain colors to choose from when ordering this bench. 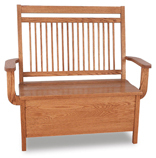 Arm to Arm: 46” or 55"
The Bayhill Bench has several Mission slats framed in the chair back. As well as extra hallway or living room seating, this bench can function as a wide dining arm chair. 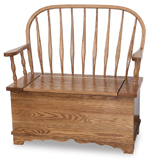 Amish craftsmanship means this bench has the quality construction to match its heirloom look. Customize your bench with options in our drop-down boxes (shown top right). Pictured in brown maple with FC-17882 Vintage Antique stain. This solid wood bench starts with side trestles for the legs, and front legs tapering up to carved tops. The back has five broad contoured slats, while the head rest dips between exposed mortise joints. The Bellingham bench exemplifies the elegant and timeless style of Shaker style furniture. Built with solid wood and with a meticulous attention to detail, the bench has the world-class quality you have come to expect from Amish furniture. 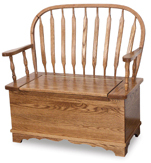 The Shaker style is evident from the parallel slats in the backrest and the unfussy details. The timeless design of this bench will make it a perfect complement to your kitchen, patio or party. Classic and simple, this bench will not go out of style. The arched back- and armrests have simple spindles offset by the detailed skirt on the bench. The bench is made out of solid wood so it will last decades in your home despite everyday use. Ask the Amish Furniture Factory about staining this bench to match your home. Elegant and rustic, this stylish bench will always be in style. The arched back- and armrests have subtly carved spindles offset by the detailed skirt on the bench. The pictured Bradley Bench is built in brown maple with FC226 Coffee stain. If your Mission-style home needs more entryway storage, the Bridgeport Hall Seat does it in heirloom quality with bracketed top and shelf, raised panels, a full length mirror, and storage inside the solid wood bench. Pictured in rough sawn brown maple with FC-42000 Almond stain. For that quintessentially classic bench, this option has timeless style that never seems dated. The tall backrest has simple parallel slats that are fine examples of the Mission style of furniture. The bench seat lifts up to reveal a storage compartment. Unconventional, this bench is a blend of metal and wood without sacrificing comfort. The low backrest is arched and that shape is mimicked throughout the armrests, legs and feet of this bench. It will surely be a conversation piece! Pictured in rustic quarter sawn white oak with FC-9018 Lite Asbury stain. Not your average Mission bench, the Cambridge has two identical back slat patterns: an hourglass paddle between two narrow, inward-curving slats. The straight head rest does not quite reach the top of the chair, and an extra trestle supports the back near the base. Decorating the sides are side trestles and decanter slats.